Predicting heat waves? Look half a world away | Watts Up With That? Joe Bastardi showed this out on Weatherbell long before this paper came out. I see this often- papers that merely repeat known knowledge. Bastardi is a national treasure. “New Jersey has seen an increased rate of autism in preschool-age children over the past four years compared to children in other states, according to a study published by the Centers for Disease Control and Prevention Thursday. I have just read the above on Fox News. It is shocking. New Jersey has invested heavily in wind turbines which produce infrasound which in turn causes varying levels of sickness, mental stress and physical disorders. More likely, autism is caused by addiction to video games. No No NO! I only send my kids to school with autistic children because I know everyone has been vaccinated. The most likely reason is they hired a num Ber of people whose job it is to identify children “on the spectrum”. And what do you expect as a result? More children on the spectrum. In Waterloo we have about the highest reported rate of hate crimes in Canada. Why? Because there is a very supportive environment in which to file a complaint. The topic here today is the Madden-Julian Oscillation. Try to focus. Fight the ease of distraction. If someone has a new insight or proposes a refinement of a mechanism we want a supportive environment in which to present and discuss the new ideas. Some US states give each County School Board …. $1.00 for each enrolled student …… to help pay for the cost of educating them. But, but, but, …… for each enrolled student that is diagnosed as “learning disabled” (autistic) the state gives the County $3.00. That is one reason the “autism rate” has increased from “1 in 10,000” children of 30 years ago ….. to its present rate of “1 in 69 children”. Kind of like the number one reason for CAGW is that they hired people and established the IPCC to find an adverse link between man and the climate. Voila! Wait! you have hate crimes in Canada? I thought that was a condition brought on by life in the U.S. primarily afflicting straight white males that have failed to inoculate by registering to vote as Democrats. Same here but replace Democrats with Liberals or NDP. We can only correlate, but this is most certainly linked with the inability to pump one’s own gas. How to account for the low rate back when nobody pumped their own gas, then? While I believe autism’s etiology is environmental/iatrogenic (rather than pathological) I doubt infrasound has anything to do with it. Other areas have far greater exposure and I doubt autism has exploded in those places. Good grief Lexy, even I don’t go that far OT. For the record, autism comes out of Vitamin B deficiency, especially in the expectant woman. Brought on by a diet low in meat, eggs and dairy. For tiny infants, does that mean breast milk & its feeding by any chance? In the 1950’s and 60’s, because the parent(s) or babysitters were too lazy or busy, ….. the TV made for great “babysitters” for young children from 1½ years old to 6 or 7 years old …… simply because of the programming such as Howdy Doody, Mr. Robert’s Neighborhood, Captain Kangaroo, etc., etc., …… that was specifically designed to “interact” with the children watching said programming. The MC’s would talk to the children ….. and the children would “talk back” to the MC. Would repeat, mimic or sing along with whatever the MC instructed. Then in the 1970’s, cartoons replaced the MC programming and all interaction between the children ceased …… and the children grew older without ever learning how to engage in conversations with other children or adults. I do not believe it possible that a Vitamin B deficiency could run rampant throughout the US population as to be the cause of autism. Besides, the FDA mandated “public school lunch programs” ….. surely wouldn’t have ignored the need of Vitamin B for the children’s health requirements. I was born in 1971, and Mr. Roger’s Neighborhood (“Mr. Robert’s?” WTF?) and Captain Kangaroo were the big programs in my childhood. The former ran through 2001…the latter through 1984. You left out Sesame Street as well. My younger siblings did not have “MC programming” replaced by cartoons. They had Mr. Rogers, Captain Kangaroo (for a time), and Sesame Street as well. They also had the birth of Nickelodeon and shows like Pinwheel. Later there were programs like Barney and Friends that took over morning programming. Cartoons in the 1970s were in the afternoon (aside from Saturdays) and often of the Bugs Bunny/Looney Tunes variety…which were nothing new (the Bugs Bunny Show first aired in 1960). Nor were Yogi Bear or the Flintstones, which were both from around 1960. So if you want to blame cartoons, then you have to start around 1960. And if you want to blame the lack of “MC” programming…well, you have to start much, much more recently than the 1970s, if at all. Infants and toddlers do not participate in public school lunch programs. Autism can be identified at as early as 18 months, and indicators are usually present by age 2 or 3. Do you guys know the TV character for kids that looks like a cross between the Pillsbury dough boy and a Cabbage Patch kid? I think it was always laughing or smiling. It it had kind of a fat, corpuscular look. I think of that when I see pictures of Michael Mann. Michael Jankowski, …… GETTA CLUE, ……. Sesame Street, Nickelodeon, Pinwheel, Barney and Friends, Bugs Bunny, Yogi Bear and the Flintstones DID NOT “interact” with the children watching said TV programming. Michael J, shall we blame the exponential rise in diagnosed cases of autism on both the Head Start and Early Head Start programs ……. Because of the autism rate, they sure as hell haven’t done much to insure children’s long-term mental development? Oh well, just another couple trillion dollars down a rathole of “promised in tentions”. Do you guys know the TV character for kids that looks like a cross between the Pillsbury dough boy and a Cabbage Patch kid? Nope that’s not it. Never seen that. Thanks anyways. Problem is with children bringing chicken meat from Sunday roast (fat and thighs are sold cheaply to Africa where they ruin local chicken farming) because WHO says red meat is carcinogenic. + fries for the microwave. If the canteen staff reacts quickly, it can take away from the kids this non-vegan, disgusting food to throw it in the bin and give the parents a bad testimonial. Peta of Newark – What you say about meat eggs and dairy is interesting. If it is correct, then one could expect a higher rate of autism among vegans. Is there? That sounds kind of gross. Why not just ply them with probiotics? OH MY, ….. you cant just ply them with probiotics, ….. because, …… they might be taking antibiotics, ……. and iffen so, ……. the antibiotics would ATTACK the probiotics and all hell would break loose and who knows what would happen. Please don’t leave OT comments high up in a reply thread. When I take the time to put together a well polished post and some twit immediately goes off on a tangent, I feel it leaves the post permanently defiled. Please use the “Submit Story” and “Tips and Notes” links in the top nav bar. Agreed, Ric. But always remember, cranks will be cranks. Joe Bastardi has been discussing and using these relationships a lot this past year. Appears to be an excellent expansion of Ben Franklin’s original thinking about weather. 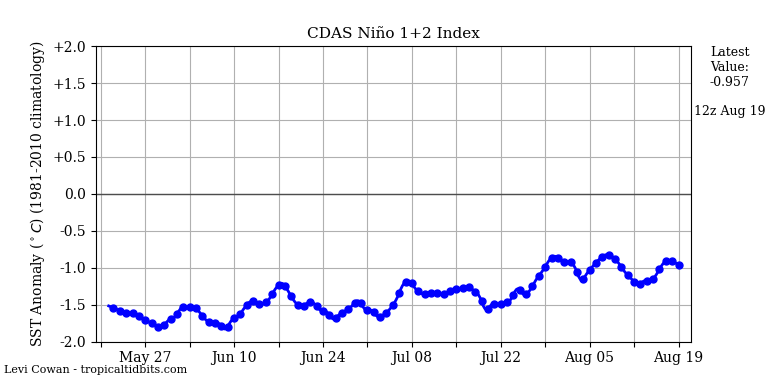 The circulation of the tropical Atlantic is consistent with the conditions of La Niña. Lows in the south of the US will be very dangerous. Is that a forecast for Feb 2020? Who’s making that prediction? I find that very hard to believe. I bet that’s anomalies, not actuals. Here you will see very current weather. The forecast is for a specific time, like right about now. The numbers appear to be in Celsius, the comment appears to be nearly totally off-topic. Well, at least they didn’t attribute anything in their study to human activity. That’s a positive, considering what we usually get. The usual tack is to claim that whatever happens, it would not have been “as bad” were it not for the anthropogenic “contribution”. This is an untestable hypothesis so it is a hand wave, only. A waving hand never makes a nail meet the wood. This analysis of the MJO hammers home the reality of what used to be called teleconnections. As focus this winter was on stalling and Omega patterns, there is perhaps a popular willingness to examine the role of the sun in creating “stable” (stationary) conditions on a regional scale. 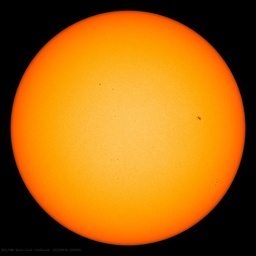 We can observe a global scale, multi-decadal experiment between now and 2060 on the influence of the sun during the next three solar cycles. My opinion is that the mentality is similar to “acupuncture”. Once you believe in it, nearly any medical issue is treatable and 97% of its practitioners agree…. Silly scientists. Political Consensus says it is the Magic Molecule which causes heat waves in the modern era. Maybe they need to be sent to re-education? 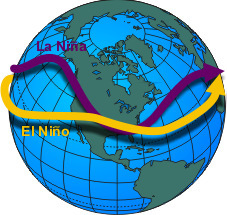 What relationship is there to the jet stream’s Pinapple Express feature and the MJO? The Pinapple Express has been bringing moisture into the US via Hawaii for months now and is the one of the reasons we have had lots of moisture over that time period. It was blowing directly into California but now it looks like it is shifting a little south. When I was a kid I was very interested in how the weather worked, and still am, of course, but it was really difficult to figure out at first. Then a meteorologist named Gary Shore came to a local tv station and introduced us all to the jet streams and how they moved and changed, with his daily broadcasts, and it finally made sense to me why we have heat waves and why we have wet seasons. If you know what the jet streams are doing then you know what the shortterm weather is going to be like. Gaia said: Let there be jet streams, and let them be chaotic, to disrupt the plans of the humans. Perhaps we should investigate snowfall in Greenland and it’s effect on hurricanes. The money shot was: ““The more we know about such associations to large-scale weather patterns and remote links, the better we can assess climate model simulations and therefore better assess simulations of future climate scenarios,” Grotjahn said.” In no way will the study help improve the unvalidated/invalidated UN IPCC climate models in predicting the unpredictable future; it looks at short-term relationships via teleconnections. They had to get that crap statement in there to garner grants and get published. The real importance of the study is to provide a basis for predicting near-term heatwaves (maybe droughts?) in California’s Central Valley. This could be of help the managers of the regional hydroelectric system. As a past modeler of that system, I think any such reliable predictions would be of great benefit. I don’t think anyone should dismiss the study because of its authors’ pandering to the CAGW mob. BTW, we must discourage postings on WUWT of irrelevant health theories. There are other blogs for those interested in such speculation. Here’s a clue, California. Prepare for drought by storing more water in more reservoirs. You’re welcome. I have an autistic child. He’s very high-functioning, speaks good German and is about to complete a BA in History, but is in the spectrum. One of his big self-stimulations was dropping pebbles and twigs into water. One day I came across him playing a video game, and what was he doing? Dropping things off a bridge into the water below. There was a paper to be written on that behavior, I think. “eastern Pacific” should be “western Pacific”. I am confused. I do not see a direct link to man-emitted CO2 via fossil fuels and the weather patterns described here. Surely, something was left out, no? Or, is this study valuable to the “fight” because the models claiming CO2 causes fill-in-the-blank weather can use this so their predictions about AGW/CO2 are not so totally wrong? Heat waves, by definition, are waiver….the come, they are replaced by cold.